If you look up at your roof this spring and notice a lot of black streaking and dark stains, you may panic at the thought of needing a new roof. Fear not, a professional roof cleaning may be all that you need to restore the appearance and functionality of your roof. “It’s important after a hard winter like this one to inspect your roof and make sure your shingles are properly aligned and secured,” said Steve James of The Stain Shop in Linden. “Algae or mold not only can destroy your roof’s appearance, they can also cause your shingles to ‘cup’ underneath, decreasing their life span. 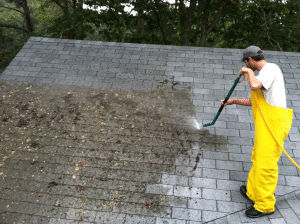 They can also cause shingles to lose their protective granules.” Using the services of a professional roof cleaner will greatly improve your home’s curb appeal, especially when the dark stains on the roof give your home a tired, worn look. Even if the rest of your home’s exterior and landscaping are in good shape, the roof streaks diminish your home’s overall well-maintained appearance. “It’s not just cosmetic, it’s also preventive maintenance,” said James. “The exterior cleaning of your home is one of the improvements that will also give you the best return on your investment.” Certain roof types are more susceptible to mold and algae growth, including an asphalt or wood shingle roof. Metal, slate and other stone tiles resist them well, but they may require cleaning for stains from bird droppings and tree debris. What causes the dark stains? The dark streaks are a type of algae that lives off the minerals in some types of roof shingles. Algae thrives in moisture, so it’s seen most often on shaded or north-facing roof slopes that don’t get a lot of direct sun. How is the roof cleaning done? The good news is that your roof can be cleaned without causing damage. Because a do-it-yourselfer may cause damage to the roof using a high-pressure method of cleaning, it’s best to call a professional who can provide the service safely — for both the shingles and the homeowner. For example, Steve James of The Stain Shop uses a non-pressure, safe chemical application to safely remove the stains, restoring the roof closely to its original state. Will the stains return? To keep the algae from returning, Tom Silva of This Old House recommends that homeowners mount zinc or copper strips near the roof ridge. Every time it rains, the water that washes over the strips’ exposed edges will pick up ions from the metal and inhibit the algae from regaining a foothold. When it’s time for a new roof, look for shingles with algae-resistant granules and the best warranty you can find. How much does it cost? Compared to the price of a new roof, roof washing is very affordable, starting at $250 on up, according to James, at The Stain Shop.